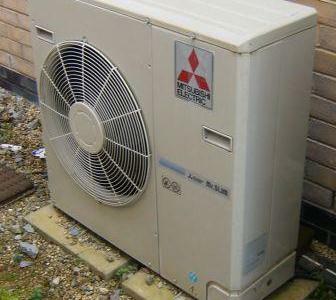 Air Source Heat Pumps absorb heat from the outside air using a refrigerant circuit. A compression cycle turns this low grade heat into a higher temperature heat capable of heating water for property heating and hot water circuits. Air Source Heat Pumps (ASHP) operate in a similar fashion to Ground Source Heat Pumps (GSHP) but use the ambient air temperature to generate heat for use in heating properties. Unlike ground energy systems the air temperature input for air source systems can vary greatly both seasonally and daily and the systems are not suited to cold winters. The performance of an ASHP is often quoted with "A7" (this being the air at 7°C). Performance should be based on EN14511, which will demonstrate their true performance. Furthermore, ASHP's are often quoted as "operating down to -15 deg C ambient". At such temperatures, the output is very low indeed to the point where there is no effective heat at all since the heat pump is almost permanently in defrost mode. As a result, the efficiency declines significantly. Condenser Coils The outdoor unit of a heat pump that has a condensing coil heat exchanger that either releases or collects heat. Also comprises the compressor. Also known as outdoor unit or outdoor coil. Evaporator Coil The indoor unit of a heat pump that has an evaporator coil heat exchanger that either heats or cools the space. Also known as indoor unit or indoor coil. Heat Pump Equipment that heats or cools by moving heat. During the winter, a heat pump draws heat from outdoor air and circulates it through your home's air ducts. In the summer, it reverses the process and removes heat from your house and releases it outdoors. SEER The Seasonal Energy Efficiency Ratio is an energy efficiency rating for air conditioners. The higher the SEER, the greater the energy performance and operating cost saving.